Gref is Grendene Chairs department that has been created with the strong mission to promote and guarantee safety for people exposed to electrostatic discharges in EPA areas. – They prevent the generation of electrostatic charges on the sitting person’s body, despite one’s movements. – They guarantee the grounding connection to the floor discharging the static electricity that may accumulate on the person’s body. Ergonomy is a new line of antistatic high – performance chairs and stools. The anatomical and enveloping backrest, equipped with lumbar support, guarantees an optimal support and enables the user to work in absolute comfort and with a correct posture, also for very prolonged work shifts. The innovative materials and the latest generation upholsteries guarantee the worker’s maximum safety and protection, as well as the perfect functioning of equipment. Ergonomy series complies to standard IEC 61340-5-1 requirements. Comfort antistatic chairs and stools line is specifically created to satisfy the work requirements of production departments. Various combinations enable this antistatic chairs line to be adapted to one’s production needs. Comfort E.S.D. series is available with fabric upholstery or in polyurethane. Both our upholsteries ensure maximum safety and protection. Comfort E.S.D. antistatic chairs and stools line complies to standard IEC 61340-5-1 requirements. Work is a particularly sturdy and solid antistatic chairs and stools line. It is specifically created to be inserted in high-intensity work environments. Its adaptability and technical characteristics make this E.S.D. 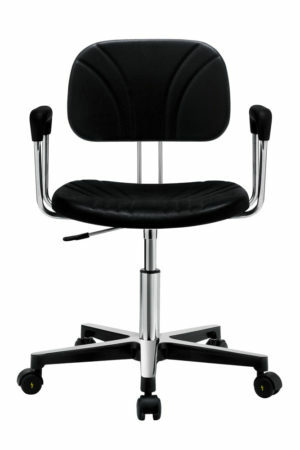 chairs line particularly flexible and suitable for use in industrial work stations. Work E.S.D. series is available both in fabric and polyurethane and it complies to standard IEC 61340-5-1 requirements. Static electricity, or triboelectric charging, is the electric charge generated on a body through rubbing. The main factor of this mechanism is given by a transfer of electrons from one body to another. Electrostatic charge is understood to be the quantity of electricity on a body that is electrified by rubbing. The phenomenon with which the charge is wasted or with which the charge is neutralized is defined as electrostatic discharge, that is the transfer of charges from an electrified body to another body having an opposite sign charge. Human body can behave as a conductor and, if isolated from the floor, it can accumulated an electrostatic charge that can be damaging for the operator as for devices and production process. 1. 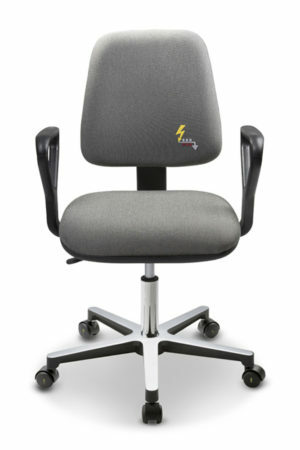 They prevent the generation of electrostatic charges on the sitting person’s body, despite one’s movements. 2. They guarantee the earth connection through the floor discharging the static electricity that may accumulate on the person’s body. Through Gref department, we have always been engaged in the safeguard of human being quality of life, in its work environment, and of the quality of production process. We have created E.S.D. series: swivel antistatic chairs and stools using innovative materials. These products are engineered and developed using materials with latest generation antistatic and dissipative properties. They are specifically build to be used in specific industrial electrostatic protected environments such as in the field of: electronics, chemicals, pharmacy, healthcare, plastics, textile. All GREF E.S.D. line antistatic and dissipative chairs and stools models have passed characterization tests and comply IEC 61340-5-1 norms. Thanks to their ergonomic and comfort characteristics, Gref antistatic and dissipative chairs can be used in environments that are different from the above mentioned ones or in all sectors, in which an electrostatic protected environment is required (EPA areas). Always on the cutting edge in the research of innovative products that are able to contribute to safeguard both human beings’ health and a perfect operation of equipment in workplaces, GREF has developed, for its products (antistatic chairs and stools), a range of upholsteries and materials for the molding of seats and backrests, all of them with latest generation, permanent, antistatic and dissipative properties. The fabric used for the upholstery of antistatic chairs and stools is a special ESD certified fabric, which is able to optimally prevent and dissipate electrostatic discharges. This particular manufacturing allows this fabric to prevent and to dissipate the static charge generated by the operator’s body rubbing, in order to completely avoid any damage to the product during its manufacturing, as well as to the devices in the workspace and to the operator. The material used for seat and backrest has got high-level antistatic dissipative qualities, it is water-repellent and resistant to the influence of hygienic and sanitary environments (where a contamination risk exists); in addition it offers an excellent comfort. 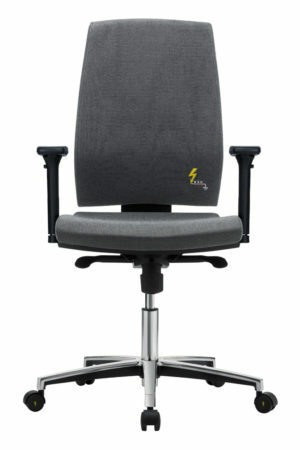 ESD chairs and stools, with integral polyurethane seat and backrest, are engineered products, designed to be used in particular industrial environments with controlled static electricity,such as chemical, electronic, pharmaceutical, healthcare sectors and in the “clean” environment of white rooms. Artificial leather is a highly technical, soft, completely washable and hygienic material. These characteristics combine with high electrical conductivity and fire resistance. This product therefore becomes optimal for use in the hospital sector, laboratories and industry in general. We ensure a double protection! They guarantee the grounding connection to the floor discharging the static electricity that may accumulate on the person’s body. In addition to guaranteeing high standards of safety and protection in EPA areas, Gref ESD chairs offer the highest levels of ergonomics and comfort. The chairs and stools have ergonomic seats and backrests, a wide choice of adjustment mechanisms and armrests that are available both adjustable or fixed. All this makes this ESD chair and stool line the ideal tool for long-term use in workstations, which can significantly improve the physical well-being of the user.